When my sister Ann, told me that her and her daughter (my lovely niece Erin) were making some fall pumpkins, I asked her if she would please take pictures and include a tutorial of their fun. They used great fabrics and made a multitude of sizes. In an afternoon they cranked out enough for both to have their own little pumpkin patch. Thanks for sharing Ann and Erin! Cut your selected cotton fabric to size. 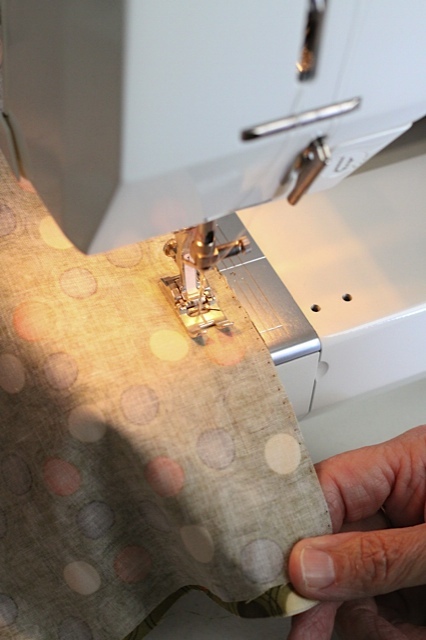 The size of your fabric should be twice as long as it is tall/wide. 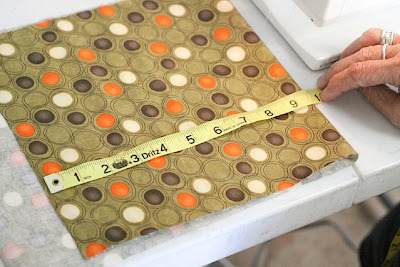 A 6” tall fabric would need to be 12” long, 8” tall would be 16” long, and so forth. Our largest pumpkin is 12” tall and 24” long, down to the smallest at 4” x 8”. Fold fabric right sides together and machine stitch along the “height” of the pumpkin/fabric. We used a 1/2” seam allowance. You could also hand stitch this seam. Gather the bottom of the pumpkin. This can be accomplished a couple of ways. You can use 3 strands of embroidery floss and make a running stitch along the length of the fabric, cinch together and knot. 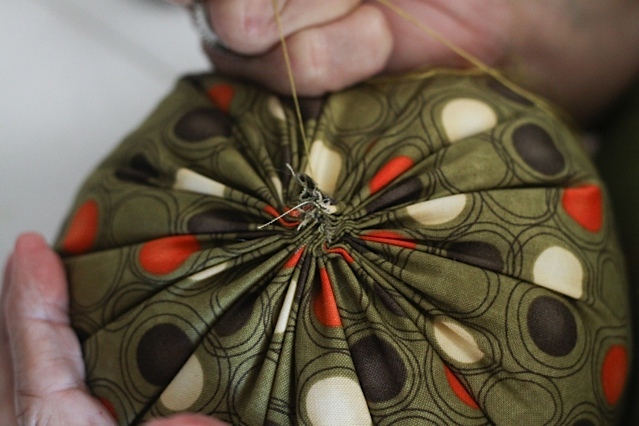 Or we found it easiest to stitch on the machine a long and wide zig-zag stitch over a length of crochet thread. We did both layers at once....doesn’t matter if it’s cinched together....it’s all gathered together in the end. Cinch up the crochet thread ends tightly and knot the ends well. Quick and easy! 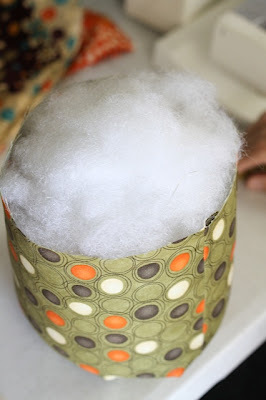 Stuff your pumpkin using polyester fiberfill. Stuff pretty firmly. We didn’t stuff the first one tight enough and it was a bit ‘floppy’. Basically it’s stuffed well, then heaped over the top a bit. 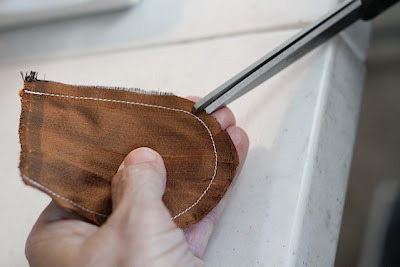 Handstitch a running stitch about 1/2” from the top edge all the way around. 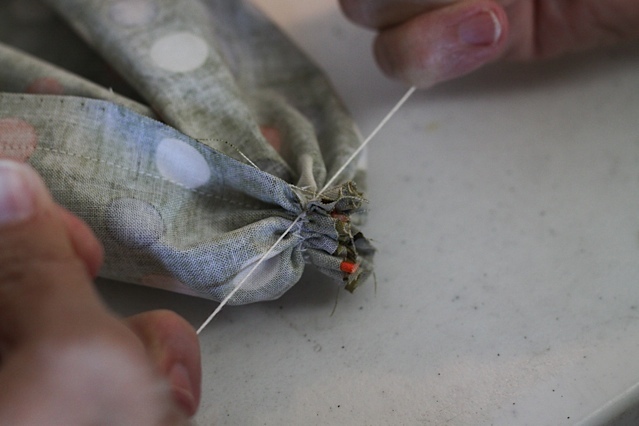 Cinch it up tightly, stuffing the fiberfill in as you go. You may need an extra pair of hands for this part! Whipstitch closed, then knot tightly. 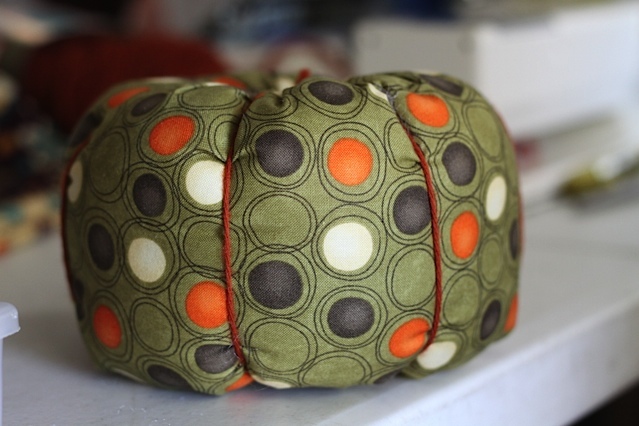 Give your pumpkin some shape using a coordinating or contrasting yarn. The smaller pumpkins we were able to do with a plastic yarn needle just fine. However, for the larger (especially the firmly stuffed ones!) 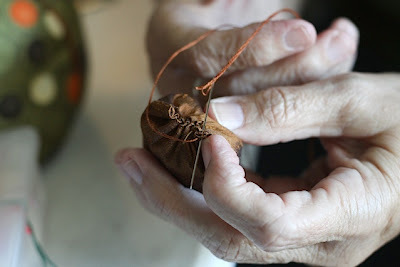 ones, we used a metal doll needle that was the longest one we could find that would accommodate the yarn. 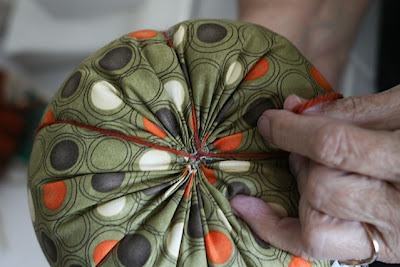 Thread the needle and knot one end. 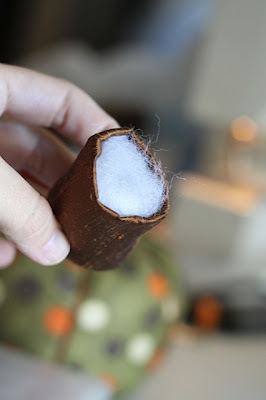 Be sure you use a rather long piece of yarn....it needs to wrap around the pumpkin several times. 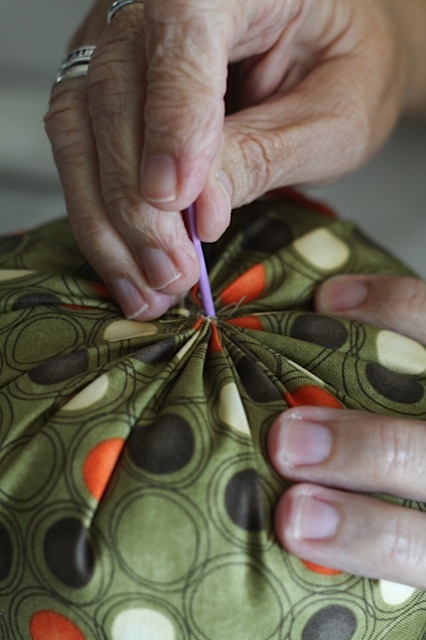 Beginning at the bottom, stick your needle in the center and bring it up through the center top. 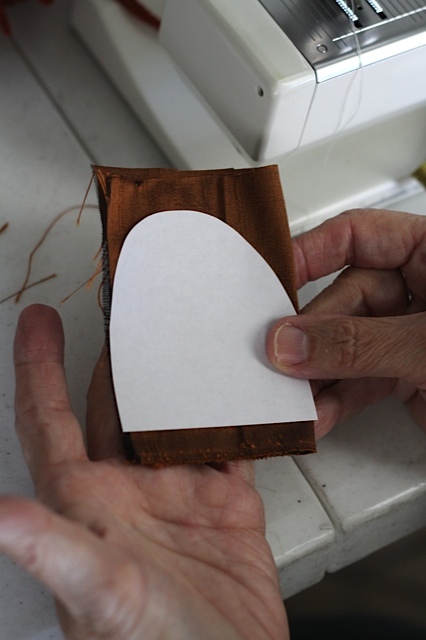 Continue stitching around your pumpkin making defined sections all the way around. Knot the yarn at the top. You can use coordinating cotton fabrics for this, but we thought it needed a little more pizazz. We purchased 1/8 yard of dupioni silk for the stem. We just drew a basic shape on a piece of paper for a pattern. Cut out your stems....two pieces per stem. Stitch with right sides together around the top. 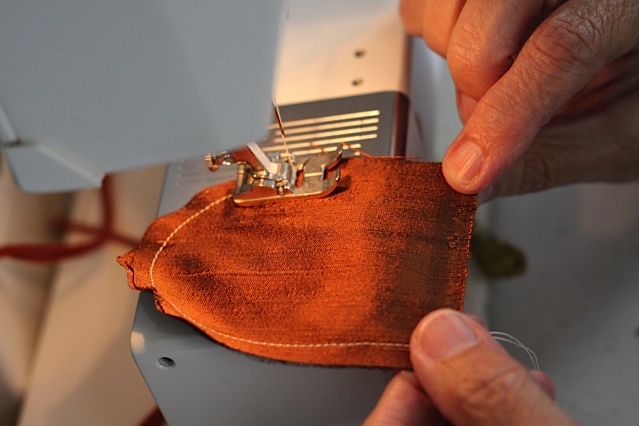 You can either machine stitch or hand stitch. Leave the bottom open for turning. 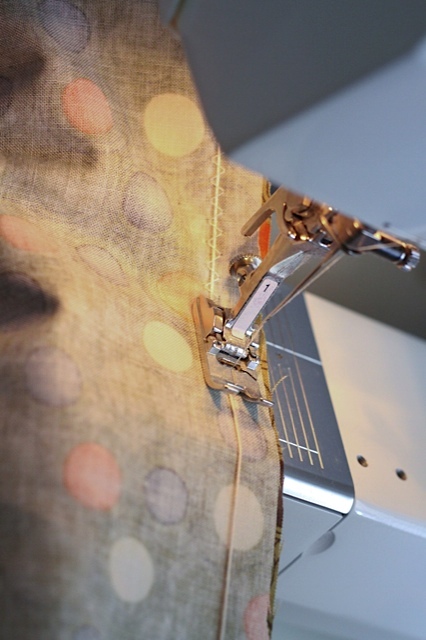 Before turning, though, clip the curves 3 or 4 times to ease the curve. Turn right side out. Stuff firmly. 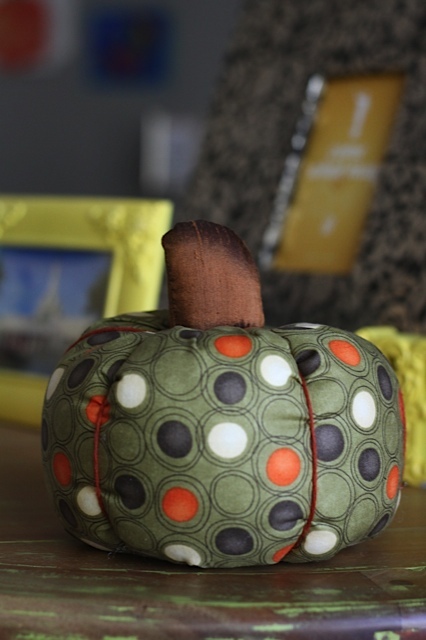 ...we found that you can just as easily lay it on top of a pumpkin and handstitch it onto the top. Either way works. We tried them both. 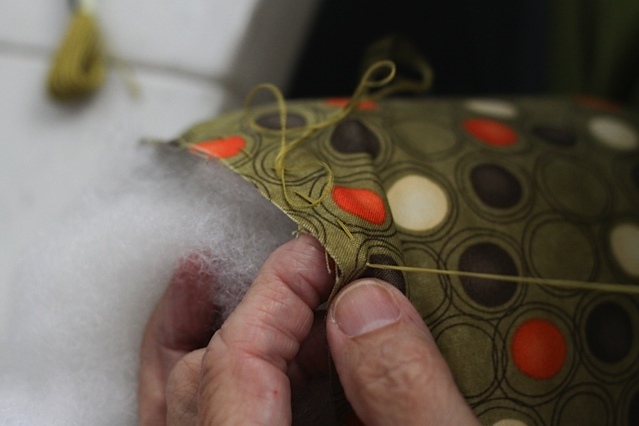 We found that it was best to have the thread you use match the stem so any exposed stitches blend in and aren't so noticeable. Love that some are non traditional colors! Thanks again Ann and Erin! These are adorable! Thank you for sharing the tutorial! I love them all!! What a cute idea. Thanks for sharing the step by step pictures. genius! Thank you for the wonderful tutorial! 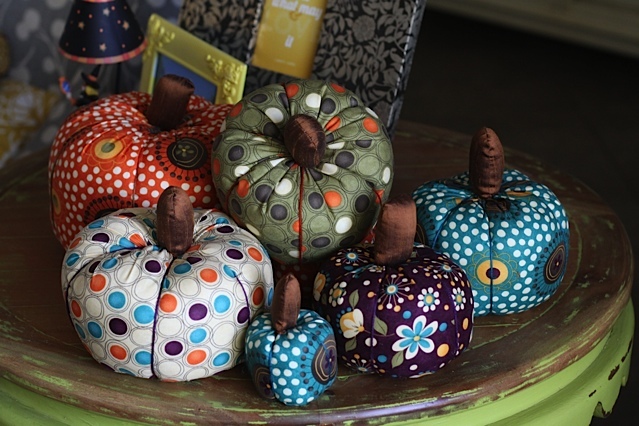 this pumpkins are GORGEOUS! 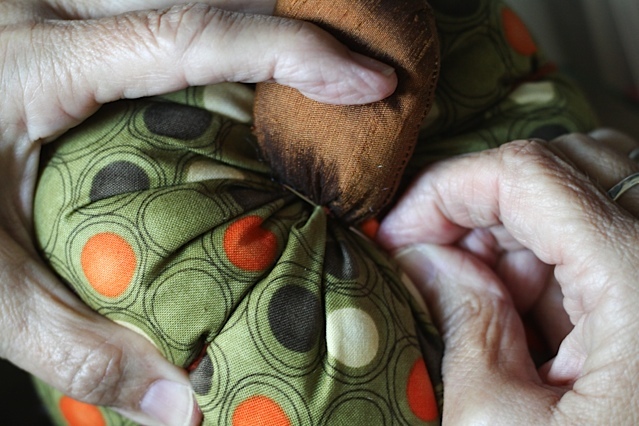 Creatology...my sewing fingers look like my mother's!! Funny how that happens! 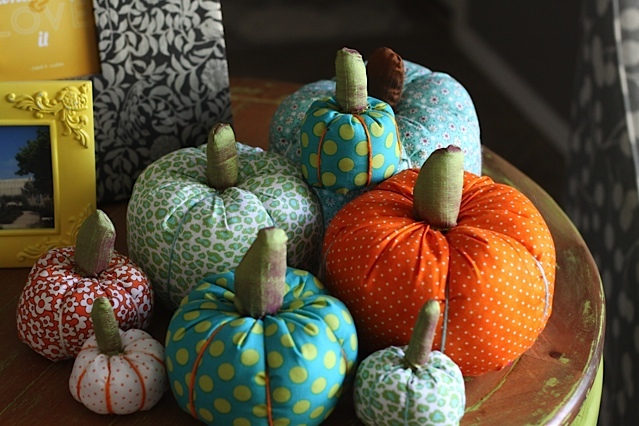 Very cute pumpkins - love the fabrics you used. Just adorable! Thanks for Halloween inspiration. I saw something similar at a local craft fair. These are darling...and now I know how to make my own!! Thanks!! These pumpkins are wonderful! Thanks so much for the step-by-step instructions and I love the different fabrics! Thank you! So stinking cute! 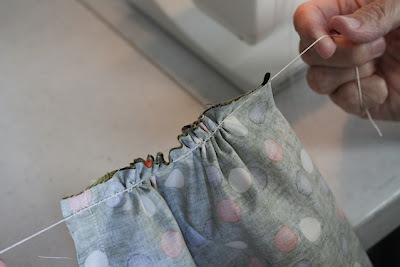 With those wonderful step by step instructions I think even someone like me who rarely sews could do it. Could picture these on the thanking table or buffet. Ditto on Sharon's "So stinkin' cute!" Thank you also for the step by step tutorial. I love them! These are so cute. I have just the right fabric for making some. Thanks for the tutorial. These are adorable. Thanks for sharing. 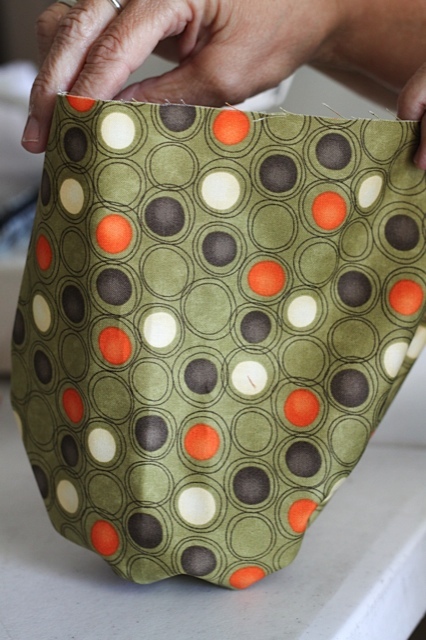 Will have to dig through my massive fabric stash and find just the right fabrics. Adorable! They look so easy to make...guess I should get started.